Statement: If two arcs are congruent, then their chords are equal. Statement: There is only one circle passing through three non collinear points. 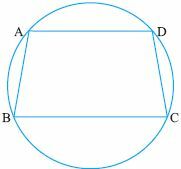 Q 1: AC and BD are chords of a circle that bisect each other. Prove that AC and BD are diameters. 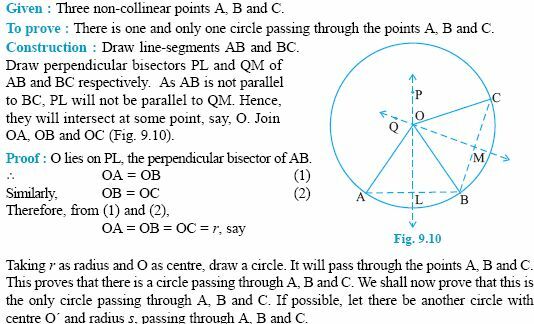 Q 3: Two circles intersect each other at points A and B, if AP and AQ be the respective diameters of the circle prove that PBQ is a line. Q 4: Two diameters of a circle intersect each other at right angles. Prove that the quadrilateral formed by joining their end points is a square. 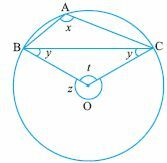 Q 5: BC is a chord of circle with centre O. A is a point on the major arc BC as shown, prove that angBAC + angOBC = 90. 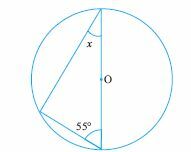 Q 6: Find the missing angle. 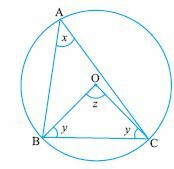 Q 7: BC is a chord of circle with centre O. A is a point on the minor arc BC as shown, prove that angBAC - angOBC = 90. Q 8: D is the midpoint of side BC of isosceles triangle ABC with AB = AC. Prove that the circle drawn witrh either of the equal sides as diameter pass through D.